I've lived in Maine most of my life. Every time I travel, I meet lots of nice people, but no one keeps it real like a Mainer. So I'm going to give it to you straight. I'm obsessed with my new bag from Wildwood Oyster Co. It's beautiful, functional and ties in the coast of Maine. To me, there are two smells I love-- the smell of New England salt air and the smell of gorgeous leather. 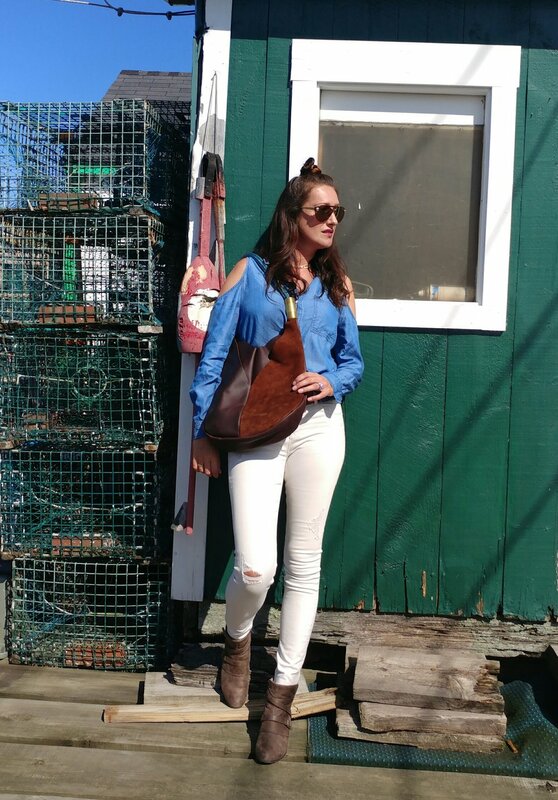 The combination of fashion, durability, and love for the ocean inspired the design of the Wildwood Oyster Co. bag. I created this simple, minimalist handbag to fit everything-- including my laptop and beach towel-- so that I could wear it to work or bring it to the beach. The brass and copper fittings are special to me because I like to see something industrial reimagined as bling. I believe style is a place where fashion meets function. If you can't walk in your heels, what's the point? They may look beautiful, but YOU sure don't while you're struggling to take steps. The same goes for your bathrobe. It may keep you warm and be super comfy, but you wouldn't walk out of the house in it. Your bag should have the same level of style. I own a white lamb-skin Chanel purse that I never took out of it's silk bag it came in. I was scared it would rip, stain, lost, etc. My husband convinced me to take it on our summer vacation to Newport and the first day, ruined. Who knew white lamb-skin can't be exposed to sun? The beautiful thing about my Wildwood Oyster Co. bag is that it's a perfect balance of fashion and function. With contrasting-sturdy leather, eye-catching brass detail and brightly colored dock rope handles, it can get me from dropping the kids off at school to a dinner date with the hubby. My Wild Wood Oyster Co. bag has been turning heads and getting compliments daily. Order yours HERE. My husband and I grew up on the South Shore of Massachusetts spending every summer with salt in our hair and sand in our feet. We fell in love with Maine and found a cottage by the water in Cumberland, Maine, we knew it would be the perfect spot to expand our love for oysters and start our own oyster farm.